This week's topic for Illustration Friday is "Late". It is digital and done in CorelDraw. I love the texture and character created by that Time Book background. The scarf also feel so wonderfully whimsical. 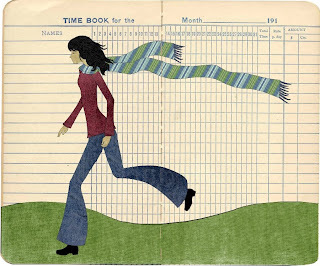 I love the ideia of using the "time book" to paint your illustration..
Lovely work! I really enjoy pieces done on unusual grounds. Really nice Illustration! I like the colors and composition a lot! The background is original. Good! Great piece and take on the theme. nice work! the background choice says it all.